This week marks our last week in Australia and with only days remaining we still hadn’t tried Vegemite. It’s not quite on the same level as the kangaroo, but it’s still a major icon of Australia. If you ask an Australian about it, they all seem to love it, but confess that it’s an acquired taste. Even on our previous two visits to Australia, we happily avoided it. I’m not sure why it’s taken us so long to “give it a go” as they say in Australia, but I think I was held back by a couple things. 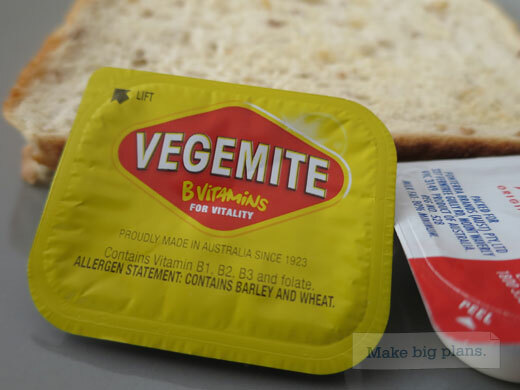 The Vegemite labels have used “concentrated yeast extract” to describe the product. I don’t know about you, but yeast flavored anything sounds about as appealing as thong sweat (take either meaning of thong you want). Vegemite is actually a byproduct of beer. It’s the leftovers of the brewing process so it’s simply dead yeast and such. I’m a huge fan of of brewing–Australia has some great micro brews–but eating the leftovers and dead cells from fermentation just doesn’t sound good and to be honest, I’m not sure how anyone ever sold the idea. But hey, I didn’t love beer the first time I tried it and that certainly has changed, so perhaps there’s hope for spreadable yeast too. Despite my perceptions of the name and flavors, the makers of Vegemite must be doing something right. The bright yellow jars take up loads of shelf space at the market right next to the peanut butter. Plus they sell over 22 million jars of the stuff every year which leaves me wondering if we’re missing out. Perhaps it is worth a go! We actually met a couple of women on a recent boat trip in the Whitsundays. One grew up in our home state of Colorado and has been in Australia for 15 years. The other grew up in Sydney. They both insisted that we try Vegemite before leaving and imparted a few tips for tasting. Per their advice, you need to spread Vegemite very thinly on toast. But before you do that, lay down a thick layer of butter. Yes, butter. Apparently, Australians don’t actually like Vegemite on its own either. If you use too much, it’s overpowering and salty. They also say to add cheese or even an egg to your toast. So, I think to give it a fair go, you have to think of Vegemite as a condiment to be used sparingly. It’s not like jelly or peanut butter even though it shares the same shelf space. And, whatever you do, don’t taste Vegemite by itself. In fact, don’t even smell it. That alone may deter you from tasting this “Australian delicacy”. How to taste Vegemite: toast, butter & Vegemite. Now that we knew how best to spread Vegemite, we no longer had any excuses not to try it before leaving. After all, we’ve tried local delicacies in China and Thailand, why wouldn’t we do the same in Australia? However, we didn’t want to invest in a whole jar for ourselves. Luckily, our bed and breakfast in Perth provided the perfect opportunity for a taste. Along with toast and jelly, they had single serving packets of Vegemite! Perfect. I was actually excited to try it. We just needed to heed the advice we received to spread the butter thick and the Vegemite thin. Everything is better with butter any way (right Vanessa?). So, I toasted the bread, applied a liberal swipe of butter and then applied a relatively thin layer of the black paste. It didn’t look or smell very appetizing but I was still determined and took a bite. My expression revealed the verdict. It was foul. Jillaine tried it too and gave up after two bites. I gave it a few more bites thinking it might get better, but I only made it half way through the slice. It tasted salty. It tasted dirty. It tasted musty. How could anyone enjoy this stuff? Even though I didn’t like it, I still was curious. Why do Australians like it? So, I began polling Australians that we met over the following few days. All of them reiterated that a thin layer is best. When they heard I didn’t like Vegemite, they quickly implied that I must be doing something wrong with “did you spread it too thick?” I began to doubt myself. Maybe I did put too much on and didn’t give my taste buds a chance to really enjoy the subtleties of spreadable yeast. I decided I should try it again. One morning, I reached for a Vegemite pack instead of the strawberry jam. An older couple from Melbourne was staying at the B&B as well and joined us at the table. We’d been making small talk with them and so I asked if they would inspect my Vegemite technique. Was it too thick? Both of them said it looked perfect and then watched as I took a bite. I tried not to let my expression reveal too much and calmly revealed the result. It was still foul and the butter didn’t really help soften the taste either. I definitely had a very thin layer this time, but I still couldn’t choke down a whole slice. We’ve really enjoyed the Australian culture and way of life. There are certainly things we’ll miss. As for the Vegemite, I’ll gladly leave that piece of culture for the Australians to enjoy.